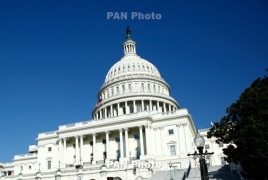 PanARMENIAN.Net - In a highly offensive political move aimed at derailing H.Res.220, a bipartisan genocide prevention measure drawing upon the lessons of the Armenian Genocide, three of the U.S. House's remaining enemies of Armenian Genocide remembrance have introduced "fake" legislation on Turkish-Armenian relations, controversially stripped of any mention of the Armenian Genocide, reported the Armenian National Committee of America (ANCA). "A sick and cynical ploy: historically inaccurate and morally offensive. All the world knows that any improvement in Armenian-Turkish relations will need to start with Ankara openly acknowledging the Armenian Genocide and accepting its modern-day responsibility for the vast moral and material consequences of this still unpunished crime," said Aram Hamparian, Executive Director of the ANCA. "Reps. Stivers, Cohen, and Sessions, - in stripping out language about the Armenian Genocide from a bill about Turkish-Armenian relations - are, effectively, carrying Turkish President Erdogan's water in Washington, advancing his shameful denial campaign even as he's doubling down on his government's anti-American actions and attitudes." H.Res.573 was introduced by Ohio Congressman Steve Stivers (R-OH) with the support of Congressional Turkey Caucus Co-Chairs Pete Sessions (R-TX) and Steve Cohen (D-TN). Rep. Sessions spearheaded a similar resolution in the previous Congress, by all accounts, at the urging of former Congressman Connie Mack, who, upon retiring, was retained by the Turkish Institute for Peace. That resolution secured a total of 2 cosponsors.